What our partners say of IB ? The IB programme offers 30-35 selected students the opportunity to act as intrapreneurs, undertaking concrete initiatives in an international context and transforming ideas into business success. It offers ONE year abroad: 4 to 5 months of academic exchange in a partner university and a 6-month internship outside Europe within an international SME, multi-national or NGO. 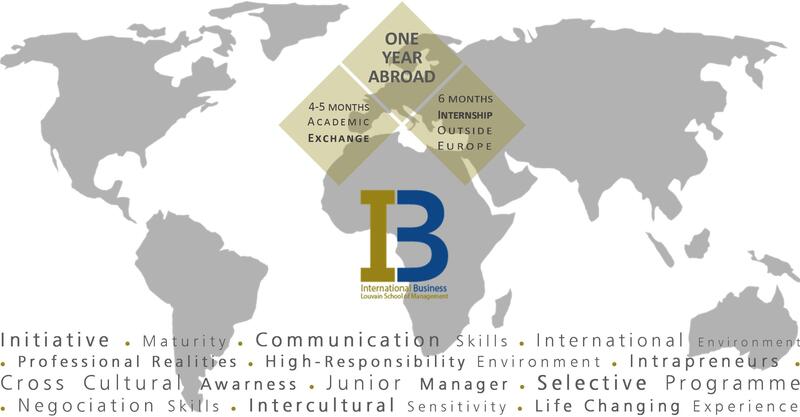 The IB programme looks for students with a specific profile, capable of being 1 year abroad combining academic requirements and a professional experience. In order to find the specific skills, Louvain School of Management works in collaboration with Steve Skills to conduct the selection procedure.